(1 Customer Reviews) | Write Review 6 issues per year History Magazine opens a window on the past, providing compelling stories about how our world became the place it is today. You’ll discover thrilling stories of exploration, invention, innovation and conflict, and learn about the development of government, medicine, technology, trade, the arts and the art of war. 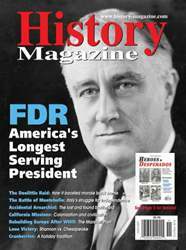 Written from a North American perspective, history Magazine’s articles are clear, informative and insightful. History Magazine breathes life into the stories of the past, telling tales of both pivotal moments and everyday life with passion and spirit. 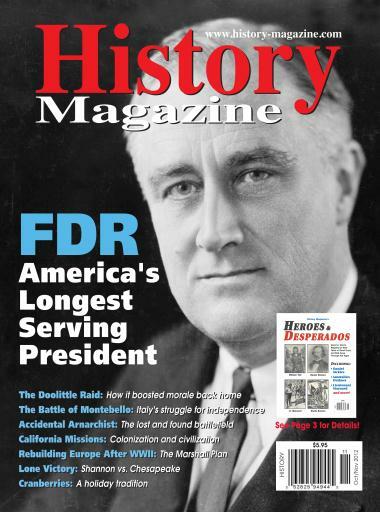 *This weekend we are offering a 30% discount on digital subscriptions to History magazine. For more details please visit the Pocketmags Latest Offers page. Heros & Desperados See Page 3 for Details! You'll receive 6 issues during a 1 year History Magazine magazine subscription. History Magazine opens a window on the past, providing compelling stories about how our world became the place it is today. I love reading this mag, which my wife subscribes to. You'll receive 6 issues during a 1 year History Magazine magazine print subscription.